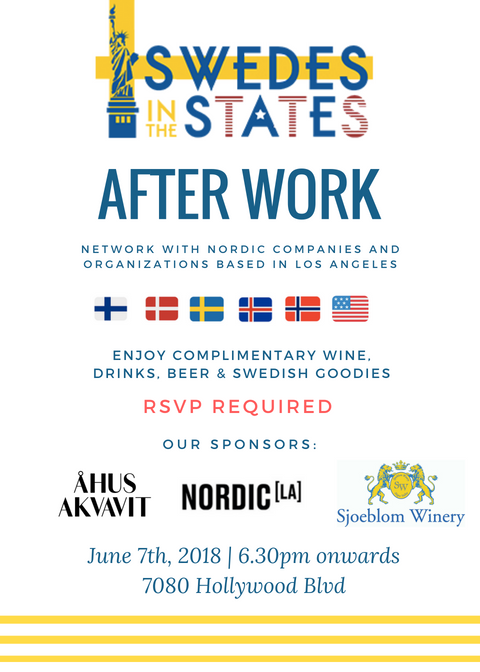 JOIN SWEDES IN THE STATES, TOGETHER WITH NORDIC LA, FOR AN AFTER WORK AT OUR OFFICE! Swedes in the States has finally transitioned from existing solely online to having a physical presence, and we chose L.A. to be our first home. We want to celebrate this by inviting all our L.A. neighbors to our office at nordic.la in Hollywood. Enjoy some free wine, drinks, and beers will be served thanks to our friends, and sponsors, at Sjoeblom Winery, Åhus Akvavit, and nordic.la. We will also be serving Scandinavian food and desserts. You’ll have the perfect opportunity to network with other Nordic organizations, companies, and people based in L.A.
And of course, as always, ALL nationalities are welcome.